Fidelity Bank is one of Nigeria’s leading banks with numerous assets both in Nigeria and Africa. The bank is well known for providing banking products which are customer oriented. Their banking practices are guided by its missions and objectives to move forward. The bank strives to be the best in all market they find them self. Fidelity bank offers its customers a lot of services which range from regular commercial banking services to corporate banking. They also cater to small and medium business who are looking for a bank to trust and invest their savings. With fidelity bank, you can also apply for loans for education, car and for your home. They also let you carry out money transfer using various conventional methods. Such methods include using instant banking which lets bank using the *770# USSD code. You can also transfer money using fidelity cards through their dedicated 24/7 ATMs which are scattered across the country. 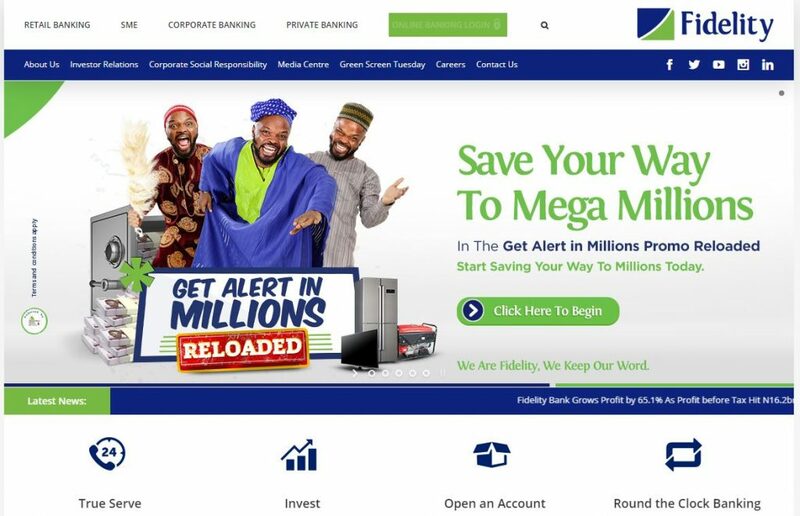 Fidelity Bank Nigeria has an official website which you can use to perform certain banking actions. To get to their website, you need to type into your URL the following address https://www.fidelitybank.ng/. Once on the site, you will be able to see the various service which they offer and how to apply. With fidelity bank retail banking, you can carry out regular banking transactions as well as open an account. The retail banking service allows you to own a savings or a current account depending on your choice. They also allow for payment of basic bills such as water and electricity. One benefit of using fidelity bank retail banking is you get the chance to apply for a loan. No matter what you need that additional cash for, wedding, car or home, you can get it from fidelity bank. You can also carry out transactions in Nigeria from abroad using diaspora banking. You get the chance to make money transfer to friends and loved ones anywhere, here or abroad. There are difficulties which small and medium enterprises face every day which makes it hard for them to grow. With the fidelity bank SME bank products, those difficulties can be managed easily. The bank provides SMEs with advice on how to grow out of this grouping and provides accounts designed just for SMEs. They try to advise and educate upcoming SMEs through its regular SME radio program. The bank also grants SMEs loans. These loans are for those who are having trouble raising finance for their business. These loans are tailored with attractive terms to suit the needs of SMEs. The corporate banking of fidelity bank has been the flag bearer of corporate banks in the country. This can only happen if the bank is filled with the best professionals who are experts in their own fields. These professionals always offer new and creative solutions to whatever problem a customer might have. They also provide for the needs of a wide variety of industries some of which include agriculture and aviation. The bank provides a whole host of varying products and services to its clients. They include but not limited to a letter of credit, project finance, and syndicated finance. The bank’s private banking provides three basic services among which are; wealth maximization, wealth preservation, and wealth transfer. Wealth management services aid you to build your current wealth through achieving the financial objectives you set for yourself. They provide investment and saving advice to aid you to achieve this. The wealth preservation service involves making sure that you do not lose your money when you make investments. This is done by collaborating with its branches all over the word to give you the right investment choice. Wealth transfer involves providing a portion of your wealth for your children and their children’s children. Fidelity online banking provides you with an easy way to perform banking services without being physically present at the bank. From the comfort of your home or office, you can carry out banking transactions. All you need to do this is a laptop and internet connection and you are good to go. Fidelity bank online banking allows you pay bills from the comfort of your home at any point in time. Such bills include water bills, electricity, and even cable bills. There has never been an easier and safe method to carry out bank services. You can also transfer funds to your loved ones anywhere they are in the world using the fidelity online banking. To log in to the fidelity online banking portal, on has to first visit the fidelity bank login page. You have to type in the following URL https://online.fidelitybank.ng/#/login into your browser. For those who already accessed fidelity online banking login before, all you need to do is type in your username and your password. This will grant you access to the online banking features. If you do not already have an online banking presence, click on the register here option. This can be found just below the sign in option. Here are the steps to take to register. The first step is to type in your account number in the required column. A fidelity code will be sent to the number you used to open the account. Make sure the phone is at hand when opening registering for fidelity bank online login. Once the above step is done, click on get started. This will take you to the next step. Here you will be required to type in a username and password. This will be used to access fidelity online banking login at any time. To complete the sign-up process, you must install the fidelity bank soft token app. You will have to set this up yourself. Once you are done setting this up, you can begin carrying out transactions using fidelity online banking. If you are unable to carry out the registration online, you can download the online form at https://online.fidelitybank.ng/#/login and fill it. Once you have filled it with the correct info, you can submit it to any fidelity bank branch close to you. If you still have trouble with this, you can go the any branch close to you to register manually.